No. 5 Nebraska (4-1) captured the Americas Players Challenge title with 4-1 win over Santa Clara on Saturday afternoon. 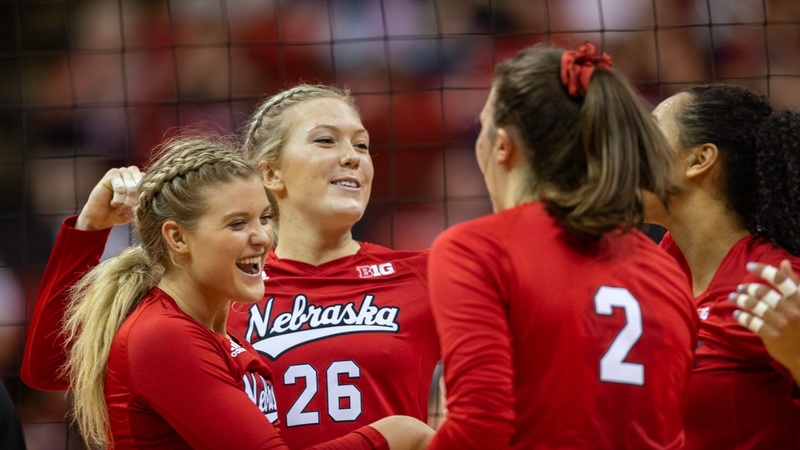 Scores in Nebraska’s for were 25-13, 21-25, 25-9 and 25-15 as a crowd of 8,047 watched from the stands. Senior outside hitter Mikaela Foecke was named tournament MVP and was joined on the all-tournament team by senior Kenzie Maloney (best libero) and sophomore middle blocker Lauren Stivrins. Foecke led the Huskers with 3.2 kills per set on .403 hitting with 2.2 digs per set and eight aces. Stivrins averaged 2.4 kills per set on .474 hitting to go with 1.1 blocks per set and six aces. Maloney led the Huskers with 3.2 digs per set. Santa Clara's Michelle Shaffer and Lilliana Light, Ohio's Lauren Park and Wake Forest's Caitlyn Della rounded out the all-tournament team. Sophomore Jazz Sweet carried her strong play from Friday night’s win against Wake Forest over to Saturday and led all players with 14 kills on .345 hitting, and she chipped in four blocks as well. Foecke had 10 kills on .333 hitting with three aces against the Broncos and also added 10 digs for her third double-double of the season. Freshman middle blocker Callie Schwarzenbach had a match-high nine blocks. Freshman setter Nicklin Hames did a bit of everything with 37 assists (her highest total yet), 13 digs, five kills, three aces and two blocks. Nebraska put together an incredibly clean first set from an attacking standpoint, ripping off 24 swings before committing their first error. The Huskers used an 8-0 run with Lauren Stivrins at the service line to build up a double-digit lead at 16-6 then pushed the lead to 13 with a 5-0 run served by Kenzie Maloney. Nebraska finished off the set with a kill from Stivrins on the slide. The Huskers out-hit the Broncos .519 to .074 in the first set with five different players recording at least two kills led by four from Sweet. Nebraska continued to roll in set two, jumping out to a 6-1 lead, but a 5-0 response by Santa Clara tied the match up at 8-all. Nebraska pulled ahead 15-11 at the media timeout thanks to a kill and an ace by Foecke but the Broncos charged out of the break with a 10-1 run to pull ahead 21-16. After recording three kills on five swings in the first set, sophomore outside hitter Sami Slaughter committed errors on five of her seven attempts in the second set before getting pulled for freshman Capri Davis. Nebraska scored three straight points to pull within two but the Broncos scored four of the last six points to even the match at one game apiece. The Huskers only hit .100 in the second set with nine errors. “It definitely showed that obviously we aren’t where we want to be yet and that we had some things to clean up and work on, but I think that we came out in set three and really proved that we are still capable of doing those things and kind of put the pedal to the metal,” Foecke said about the second-set slip-up. Nebraska got off to a great start again in the third set with a 9-2 lead early and this time they did not let the Broncos back into the game. Santa Clara got no closer than six the rest of the way and an 8-0 run gave the Huskers set point at 24-7. After a couple of errors, the Huskers closed it out on a kill by Sweet. Nebraska hit .435 with just two errors and held Santa Clara to -.103 in the third. Nebraska led the whole way in the fourth set as well, racing out to a 10-2 advantage. Santa Clara got within five at 12-7 but Nebraska but Nebraska gradually stretched the lead back out to 10 at 20-10. Santa Clara scored five of the next eight points but Nebraska closed it out with a kill and an ace by Stivrins. Davis closed out the match at the second outside hitter spot and finished with eight kills on .375 hitting. Next up for Nebraska is the Huskers’ only road match of the nonconference as the Huskers will make the trip up I-80 to take on in-state foe Creighton. The No. 15 Jays (4-2) won the SMU DoubleTree Classic in Dallas on Saturday. First serve at the newly renamed CHI Health Center Omaha is set for 7 p.m. on Thursday.